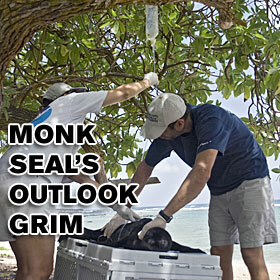 A monk seal pup is in critical but stable condition after being abandoned by its mother and another seal at a northeastern Kauai beach. The mother later abandoned the pup. National Oceanic and Atmospheric Administration workers rescued the days-old pup yesterday, and are caring for it.